Vinayak Naik is an Associate Professor at Indraprastha Institute of Information Technology, Delhi (IIIT-Delhi) since January 2015. 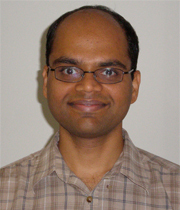 Prior to that, he was an Assistant Professor at IIIT-Delhi (2010 - 2014), and has worked at IISc, UCLA, Telcordia, and TCS. He was honored with Rajiv Gandhi Excellence award in Aug 2011 and CENS Local Employee Award in Aug 2008. His PhD students have been awarded Microsoft Research PhD Fellowship, Google Best Presenter Award at MobiSys’12 conference, and Prime Minister's Fellowship Scheme for Doctoral Research. He has received funding from MSR (India and USA), and Nokia Research (India, Finland, and USA). He is serving as a PC Chair for Mobile Software Engineering track at ISEC’15. Mobile Computing, Sensor Networks, Wireless Networks, and Systems. Computer Networks, Operating Systems, Mobile Computing, System Administeation.